A seemingly innocuous and mostly playoff-irrelevant September matchup between the Mets and the Nationals produced an historic moment last week. That night was the first time both starting pitchers made their MLB debuts in the same game in Mets history. Teams that are out of the playoff hunt produce these kinds of opportunities late in the season. Both Yunesky Maya and Dillon Gee would probably be seeing bullpen duty on a contender bearing down on the postseason, but here they are, giving owners in keeper leagues a small window in which to make a decision about their fantasy futures. First, the things that these two guys have in common. Both are older starting pitchers making their debuts. Gee is 24, mostly because he spent almost the maximum amount of time in the minor leagues and his debut was almost forced by Rule V draft rules – he needed to be added to the 40-man roster . Maya didn’t arrive until age 28 after pitching in Cuba and only recently defecting. was his lowest radar speed. Different arm angles. Different speeds. Going from a two-game sample is a terrible idea, but much of what we’ve seen in his first two starts lined up with the scouting report. For example, the Mets broadcast team doubted the 91s and 92s on the gun in Washington and called Maya a ‘dart thrower’ with little deception in his delivery. The curve was considered a ‘Rambo curve,’ but then Keith Reynolds and Gary Cohen wondered if the fastball had enough giddyap to set up his off-speed offerings. One key detail that came from Adam Rubin in the original article about Maya’s debut: “He throws a 92 mph power sinker that is challenging, although he actually was missing with that pitch against the Bisons.” The home run to Ike Davis was on that power sinker, as were a couple other extra-base hits. Overall, Maya had two whiffs on 35 fastballs in his first start, which doesn’t bode well (5.7% swinging strikes, and fastballs average around 6.7% across the league). Baseball usually works away from the fastball – it is the most-thrown pitch in the game – and if his fastball is missing spots and getting hammered, his upside is severely mitigated. In Maya’s second start, against the Braves, he lasted a solid six innings, but again showed a somewhat mediocre performance: four runs, five hits, three walks, a hit batsman, and just two strikeouts. Gee had the better first game, and also the larger sample of American baseball statistics to fall back on. The one thing that we know about Gee is that he has excellent control – he walked fewer than two batters per nine innings over his entire minor league career. The other thing we know is that he is a flyball pitcher – he never once got 50% of his balls on the ground, and his career 42.5% number in that category makes him a risk to yield lots of home runs. When he’s been on in the minor leagues, he’s struck out enough batters to overcome the home runs he’s allowed. This year, however, he showed some interesting but conflicting pieces of information in Triple-A. He had the worst home run rate of his career, which isn’t surprising because of his flyball rate. But he also put up the best strikeout rate of his career, an 8.92 K/9 that would make him a great pitcher in the major leagues when paired with his excellent control. His minor league career strikeout rate of 7.83 K/9, so we’ll have to see how that translates to the big leagues. Gee has a mediocre fastball like Maya, but he can command his changeup and curve and use them to get outs. They just might be decent out-pitches: Gee got 6 whiffs on 24 curves and sliders in his debut, and those pitches usually get 10% to 15% swinging strikes across baseball. For example, Gee’s numbers on those pitches are much better than the two whiffs he got on his fastball (a 4.8% swinging strike rate, 6.9% is average). R, 7 H, 1-0 record, 0.69 ERA. But seven walks against seven strikeouts, combined with facing the lowly Nats and Pirates, exacerbate the problem of focusing too much on such a small sample size. Both of these pitchers have their upside mitigated by lack of dominant fastballs, and sussing out Maya’s future is complicated further by a lack of historical data on which to rely. Considering that Gee plays in a park that suppresses home runs, his flyball-oriented approach might just play well enough to help you down the stretch in a deeper league, and could make him a sleeper keeper candidate in deeper mixed or NL-only leagues. 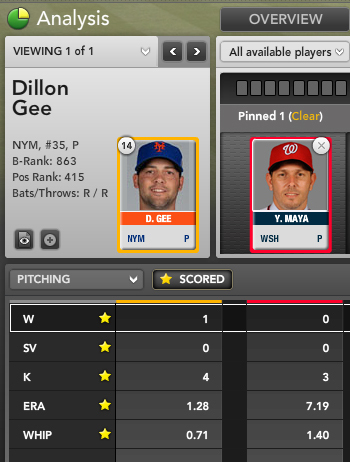 For more on inexperienced pitchers like Yunesky Maya and Dillon Gee, check out Bloomberg Sports’ Fantasy Tools.